There were 14 stops before mine – are you ready for Wicked no. 15? Somehow my secret word seems appropriate. LOL. All right Ladies and Gents . . . 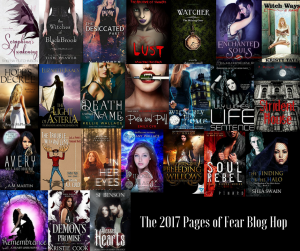 Welcome to the first ever Pages of Fear blog hop. It’s a pre-Halloween event celebrating authors who like to fright and delight with their writing. As you progress through the twenty-eight blogs/websites you’ll learn about authors you may already know and be introduced to some new ones. Everyone loves the opportunity to get something free. All of the authors have gathered together to give ONE lucky winner signed copies of their books (one per author). You may even find other types of giveaways on their sites so, keep your eyes open. While you’re looking you want to locate the secret word on each site. Make a list of the words in the proper order. When you reach the final destination (Authorsfbenson.com), you’ll find an email address. Send your list to it. The winner will be selected courtesy of random.org. Ready? Get on your marks. Need a reminder on the story? Once there was a very special _______ doll. She had been well-______ for ________. Kept on a _______ when there weren’t any young girls to play with her. And brought out and cherished when young ________ were in the __________. Eventually, the toy was forgotten and relegated to a _______ in the attic. The house was eventually ________ and all of its belongings were either sold, given away, or ________ into a ________ at the curb. But the doll… she __________. Shortly before the ________ collectors arrived, a young couple comes upon the _________. Immediately, the doll’s _______ face and _________ clothes catches the woman’s _________. “Rebecca, you can’t be serious. That’s a piece of ________,” the man points out. The young ______ just shakes his head and continues walking down the _________. His wife was good for finding trash and turning it into a ___________. She _________ the _______ in the doll’s eye.